You might have heard the buzz surrounding these exhibitions, plus we've picked a few you may like — if you’re undecided about whether or not to see them, here’s our guide to which are worth it. All are free to visit. 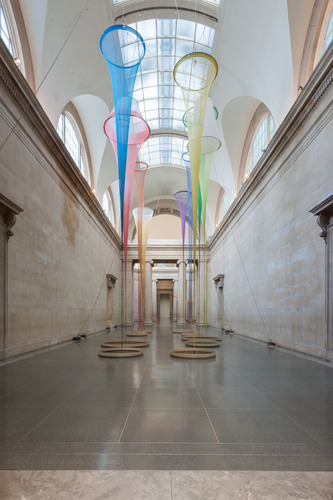 Upon entering Tate Britain it's hard to miss these visually striking colourful nets dangling from the high ceilings, above pools of dye — but they never manage to convey their intended concepts around memory and perception. The other works on display are too small for this cavernous space and so fail to have any impact. Free, until 18 October. By littering this exhibition across the V&A it ensure visitors explore the entire museum. This is great idea and so it's a pity that none of the works grabbed us and they barely scratch the surface of the theme of exploring the role of institutions in modern life. Free, until 19 July. The Whitechapel gallery continues its excellent programme of showcasing highlights from other collections, this time Turner Prize nominee Yiadom-Boakye selecting some fantastic landscapes, including paintings by Peter Doig and David Hockney, from the V-A-C collection in Moscow. In an adjacent room Peter Liversidge has introduced children to the idea of democratic protest and, while some placards such as not enjoying homework come as no surprise, it's uplifting to know most children have an excellent sense of decency, as can be seen with signs asking people to give to the poor and clean up after their dog. Free, until 14 June. The architect of the Olympic Park's Orbit returns with some new works. The reflective pieces are fun yet offer nothing new; what we really enjoyed were the giant works that look like raw meat is emerging from the walls. Free, until 9 May. We can't be the only ones who've looked at a painting and marvelled at the intricate frames as well as the work itself. Well, now frame fans can rejoice as The National Gallery has dedicated a small display to some of their most elaborate frames — the gilding and detail of fruits and faces is impressive. Free, until 13 September. Isa Genzken's latest painting series come with coins and notes attached to them, in an attempt to make a statement about contemporary society. Coming from an emerging artist these works may carry some weight, but a highly successful artist displaying them in a very wealthy gallery feels insulting to the viewer. Diana Thater's video work is a much more ambitious affair as projections convert half the gallery into a temple, and the other a cinema screen of monkeys that inhabit the temple. It doesn't achieve its claim of challenging the boundaries of a reality but it's a meditative experience. Free, until 16 May. This group show featuring only drawings has a great diversity of artists on display. 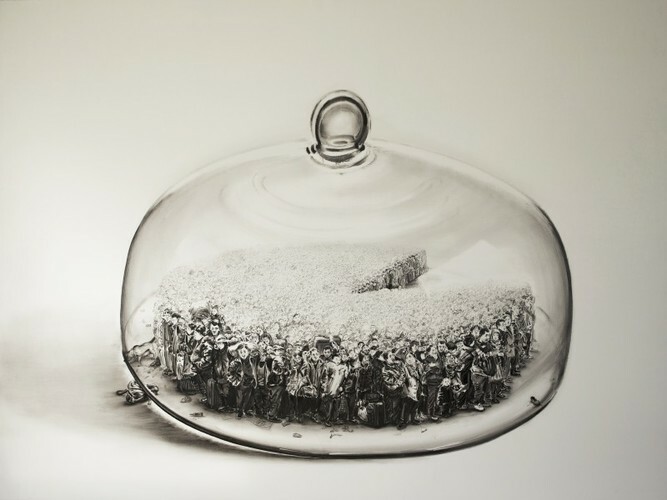 We particularly liked Lu Chao's drawings of hundreds of people crushed together and Enrique Brinkmann's subtle abstract work. Free, until 22 May. The written texts dominate this exhibition and rightfully so as they are bizarre, surreal and fun. They remind us of David Shrigley's work, yet some of the statements also have a darker side to them. Free, until 25 April. 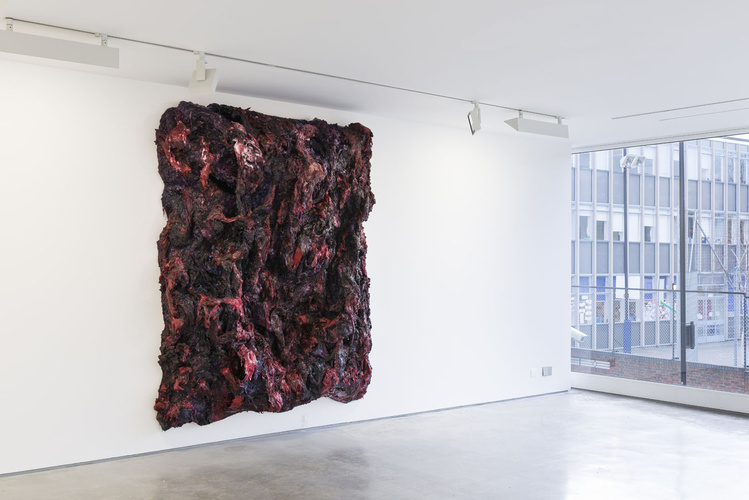 The politics of Ukraine loom large in this exhibition as a blackened wall in the shape of the country has had a Crimea-shaped chunk knocked out of it. Pictures of protests have also been doctored to show that history will not always present a perfect recollection of the past. Free, until 16 May. Also still on at these venues are impressive Victorian sculptures and early photographs at Tate Britain, the Alexander McQueen blockbuster at V&A and the fantastic Inventing Impressionism at National Gallery.